As a customer service oriented fire department, our mission is to make this site truly useful to you, the customer. Adults and children can visit our site anytime to gain valuable fire prevention and safety tips, learn how your fire department operates, meet the Chief and firefighters that serve you the customer, learn about the history of the fire department, and how to reach out to us with any of your needs. So please take the time to carefully review our site and check back often. "The primary objective of the Cumberland Hill Fire Department is the protection of human life and property from fire and the prevention and suppression of fire. In addition, it shall be the duty of the fire department to remove or cause the removal of all persons from danger and to provide emergency medical aid and general public assistance as directed by the Chief of the Department or his designee"
The Cumberland Hill Fire Department is one of four fire districts in Cumberland, RI located in Providence County, 10 minutes north of the Capitol City of Providence and 45 minutes south of the City of Boston, MA.The department operates out of Station 4, located at 3502 Mendon Road. The four fire districts, although independent from each other jointly provide emergency services to 34,000+ citizens of Cumberland, in an area of 28.6 square miles. The Department employs 14 career personnel spread out over 4 shifts, 11 part-time line personnel and 1 part-time administrative personnel. The station is staffed 24 hours a day 7 days a week with a minimum of 3 career personnel on duty at all times. The Cumberland Hill Fire Department (Station 4) responded to 1,682 alarms in 2010. Currently, the department holds an ISO rating of 4. The Town of Cumberland, RI is growing rapidly, and so the department also continue's it's growth to ensure that every citizen can feel safe at their workplace and in their homes. Any questions about the department are welcomed. Please direct them to Chief Finlay. The Cumberland Hill Fire Department is not currently selling, or exchanging department patches or emblems. Thank you. I am Kenneth A. Finlay and I serve as the Chief of the Department. My original beginning in the fire service started right here in Cumberland Hill in 1973. I served as a CHFD volunteer and later as a call man with the North Cumberland Fire Department. 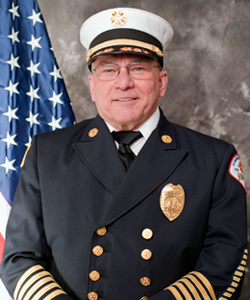 In 1977, I was appointed to the City of Woonsocket Fire Department and served in all ranks. I retired as chief in Woonsocket in 2009 to return to my roots here in Cumberland Hill. I have been an active participant in the fire service for 36 years. With that experience, I bring a level-headed approach to an ever-changing environment. My primary focus is on safety of the firefighters and the public they protect. I know that a safe work environment is necessary for productive results. The dedicated firefighters of the Cumberland Hill Fire Department are committed to serving you – which means protecting the life and property of all our residents. There are many issues confronting modern-day first responders on a daily basis. Some issues are urgent, developing each day; some are educational as we are committed to professional development; and some are financial, in order to best serve the economic needs of our taxpayers. At CHFD, we see it as the responsibility of each member to be able to respond to all of these issues and to always assist you in any way possible. The fire station is located at 3502 Mendon Road and holds much of the history of our department. Our first fire truck, a 1931 REO Speedwagon, was repurchased in the early 1970’s and restored it to its original working condition. This rare piece of history is housed here, at the fire station. The members and staff of the department can offer a great deal of insight into their commitment to the public they serve. If you have a question, or wish to stop in and see us, don’t hesitate to stop by or call the station at 401-658-0544. We’re here to serve you!